Seeing burst of colors that appears right under their hands is indeed an exciting sight. 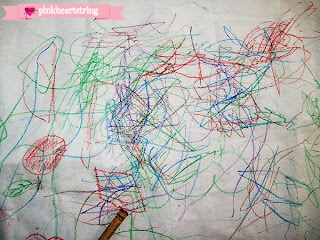 Colors make toddlers feel happy and they will surely feel a lot more joy if they are the ones creating colorful scribbles on paper. Letting a toddler use crayons is a good way to help them develop fine motor skills, fondness for art and creativity. So, why not buy a box of crayons for your little one? But you cannot just pick any crayon. There are crayons designed for toddlers. These could either be jumbo crayons or those that are triangular in shape for easier grip. You also have to make sure that you get the ones that are non-toxic because a curious tot would sometimes put the crayons inside their mouths. What's more yummy looking than a bunch of colors anyway? You can also teach your child to keep the crayons once they are done using it. If they won't listen the first time, that's okay. Just keep on repeating it and they'll eventually get it. For the first early coloring sessions of your child, always be there to guide him. I have mentioned that tots would tend to place crayons inside their mouths. If this happens, you can take away the crayons from them and explain to them that it is for art and coloring. Then show them how it is done. If they still place it in their mouths again, then you have to take the crayons out of sight. You can do coloring some other time or you can resort to other art materials like stickers. I bought Bella crayons at an early age. I taught her how to grip on it using her right hand and to scribble it on paper. I have large sheets from blu prints of house plans that I designed. These were blu prints that had some mistakes on it. Instead of throwing them away, I let Bella use it for coloring. I would place the paper on the floor and she could sit on the paper while scribbling. But she would always ask me to draw something on the paper. I'll hold her hand to form shapes and draw whatever she can think of. "Mommy, draw cat. Mommy, draw circle. Mommy draw flower. Mommy, draw caterpillar." The list is endless! lol But I still do it. Sometimes, the drawings look funny but as long she can identify it, that is fine. 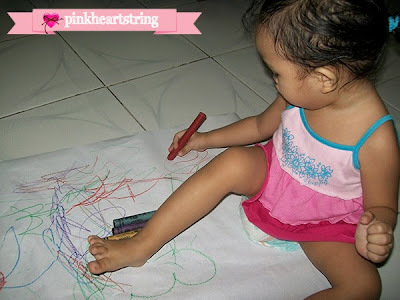 Seeing Bella occupied with her scribbling makes me happy but when she gets tired of drawing on paper. She'll draw on something else and when I say something else, I mean wherever and on whatever she can think of! She'll draw on the wall, on chairs, tables, toys, even on my computer screen and her favorite Lalaloopsy Littles, Bundles. Our room looks like Elmo's room. It has crayon writings everywhere! 1. Show them how to draw on paper. 2. Repeatedly tell them drawing on walls is not good. 3. Show them that you are cleaning the walls so they will know that it isn't really good. Or if your toddler is older, let them clean their own mess. This way, they won't do it again to avoid the chore. 4. Create a gallery of their drawings. They'll be encouraged to draw more on paper once they see their drawings framed or placed on the wall. 5. 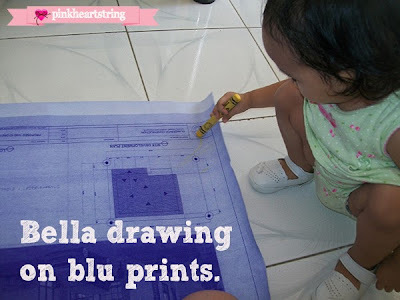 Purchase other art materials like easels and encourage your kid to draw. 6. Allocate a space in your home for their art activities. When you do this, they will be able to practice and appreciate art even more. Start doing that while your kid is still a toddler. I want Bella to develop her love for art in an early age. That is why I got her crayons even when she was still a baby. 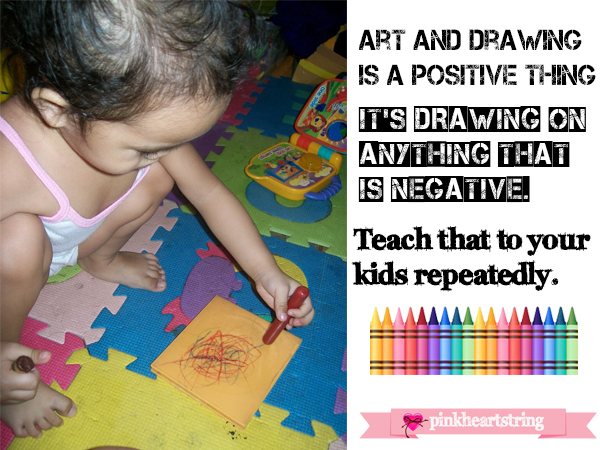 Remember that drawing is not just about fun. It can also help your kid's physical, cognitive, emotional and social development. So, if you are hesitant to give them crayons at an early age, don't be. 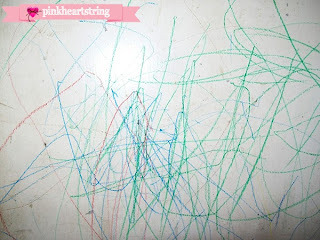 I actually want to treasure Bella's scribbles because she won't be coming back to to this stage anymore. When the time comes that she'll be able to draw well, I'd show her the first drawings she did as a toddler. 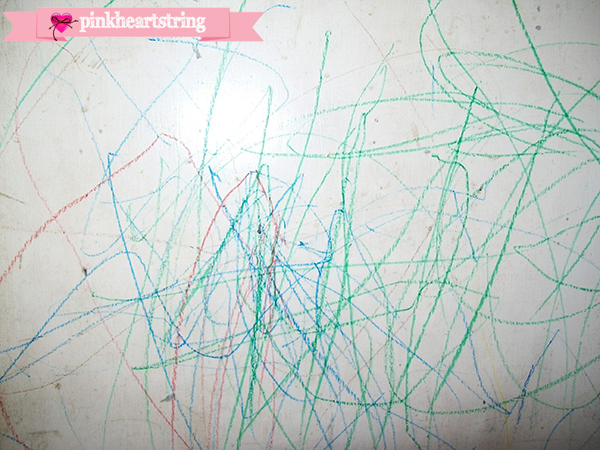 I took photos of some of her scribbles. They may appear senseless but the truth is, these scribbles mean a lot. It shows how she developed as a child, her love for colors and art, and this could pave way to a better school performance and career in the future. I guess I'll add some more. lol. I want to go back to this post when she is a bit older. I'm sure she'll laugh at these scribbles and would scold me for posting this for everyone to see. haha. But she won't be a toddler again. So, I'd better keep these photos. 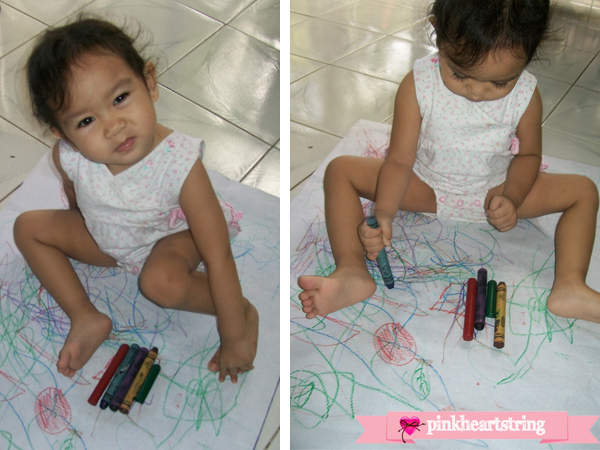 How about you mommies, how was your toddler-crayon experience? These are great tips! But I need to know, where do you buy the thick crayons? Every time I go looking, I can't find them! I gave my daughter crayons fairly young as well, I just supervised her with them like you do. I have some of her scribblings saved, and I wrote on the back the date she did them and her descriptions of what each is (e.g., big dragon with teeth in the bathtub). Of course they don't look anything like what she describes, but I think she has an image in her head of what she'd trying to create. Cute pictures! And some good tips. We are still mostly eating crayons over here, haha. My kids have been doing art from a young age too. When my son was 10 months, he was the youngest to have an entry in the county fair youth art exhibit. I love it when the kids make art! I used to bring them to the office with me and I would give them the old calendar for big pieces of paper. It kept them busy for a long time! 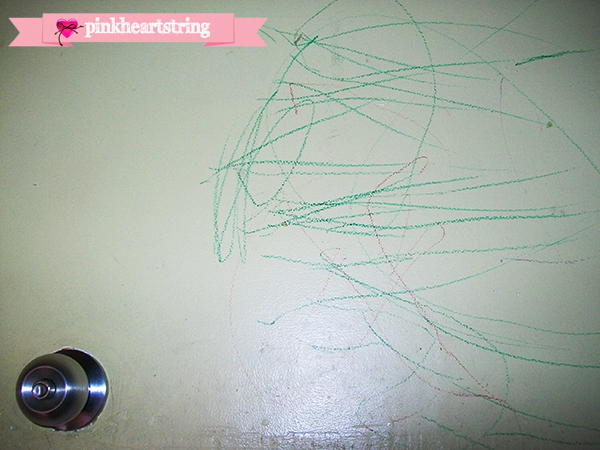 Thankfully, my kids have stopped drawing on the walls. Now they've progressed to important paperwork ;) The good news is that they love to color. we're started displaying their work and crafts on the fridge and they love that. Thanks for the BLogLovin follow, I follow you as well. I'd love it if you linked up to my weekly BlogLovin Hop (http://www.journeysofthezoo.com/search/label/BlogLovin%20Hop). Hope you find lots of new friends and stop by every Thursday. Great Post Kareen. loved the tips to get these li'l ones going. I gave my son crayons at around 18 months and told him to draw on paper only and he followed and would always ask for paper whenever he wanted to draw but now he's 2 and would sneak out and see if nobody is watching and we would be left with some masterpieces on the wall or any other surface... Hope this stage passes soon! All that beautiful artwork going on. :) I introduced crayons at an early age too. Reagan loves to draw too .. she has so many crayons! 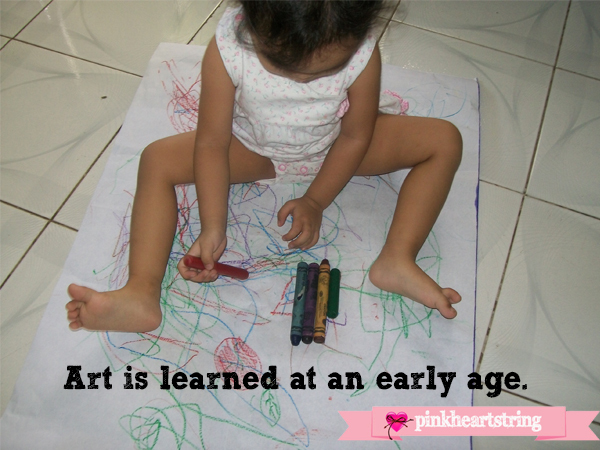 Art is such a wonderful thing to let the kiddos do on their own. Thanks for your comments everyone. I'm really glad you liked this post and yes, my daughter is really serious while working on her obras.lol. Her dad and I even thinks of framing them. I've checked your blogs too and they were all great!